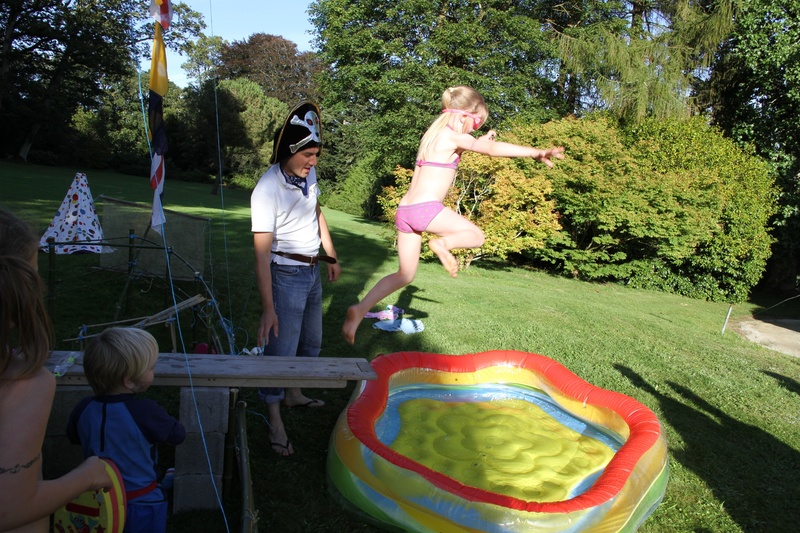 In September 2012 we entertained two guests from England, Chris and Nangi and, as you do, spent some time talking about our respective professions. We all got on famously and we discovered that Chris is a film producer based in Totnes Devon. They were very enthusiastic about our lifestyle, house and its grounds. After they had returned home , Chris e-mailed us and suggested that he produce a film for us along the lines of one that he had produced for an hotel in the UK. It took Jenny and I a hesitant six months to decide, courageously, to go ahead! Chris and his family returned for a weeks holiday at the end of May with a large camera! Over a fascinating and most enjoyable week, he collected over two hours of film and terrified Jenny and me into giving interviews in both English and French. When you see the film , you will recognise that interviews are not our strong point! 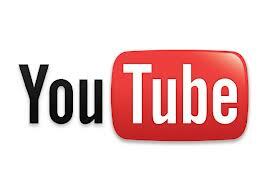 Chris then distilled the two hours into two You-tube films of just under five minutes in length. One is in English and the other in French. We are very pleased with the results, although a little self conscious and critical of ourselves. We hope that you will enjoy the films for what they are – a bit of fun. 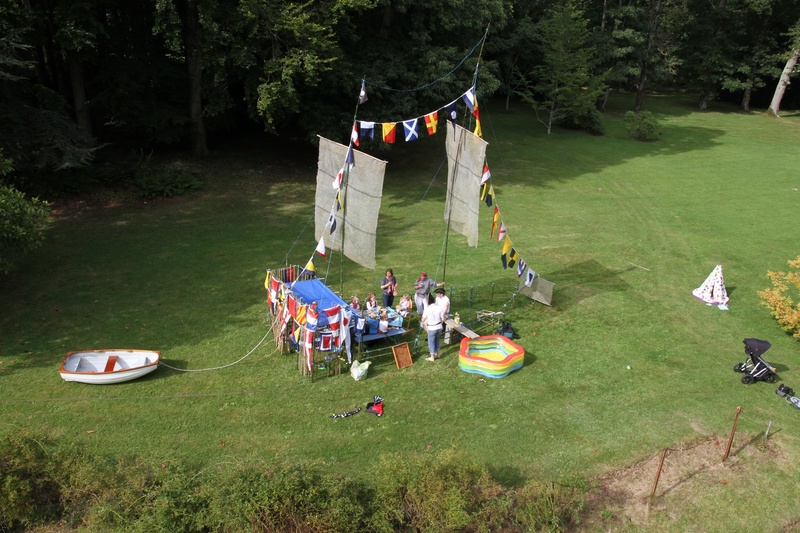 Pendant le séjour de deux hôtes ( Chris et Nangi) au mois de septembre 2012, nous avons appris que Chris était un producteur de films a Totnes dans le Devon. – (Grande Bretagne) Ils aimaient bien notre Manoir et parc. Après ils sont rentrés chez eux, Chris nous a envoyé un courriel et a proposé qu’il produise un film pour nous comme celui qu’il avait produit pour un hôtel au Royaume-Uni. Il a fallu pour Jenny et moi une période de six mois pour nous décider, hésitants, courageusement, pour aller de l’avant! Chris et sa famille sont revenus pour une semaine de vacances à la fin du mois de mai avec un grand appareil photo! Au cours d’une semaine passionnante et la plus agréable, il a filmé plus de deux heures et nous a impressionné en donnant des interviews en anglais et en français. 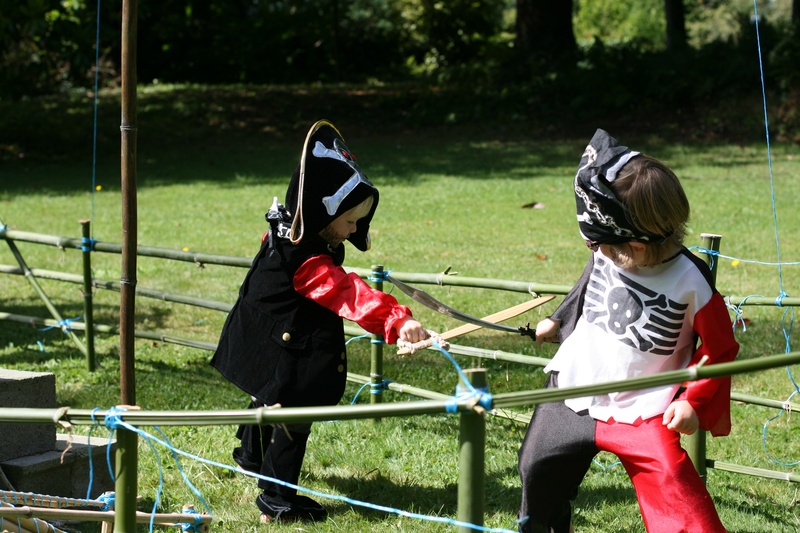 A group of nine English pirates successfully returned to their base in Bristol after a profitable raid on Coat Amour, Morlaix, Brittany, today. 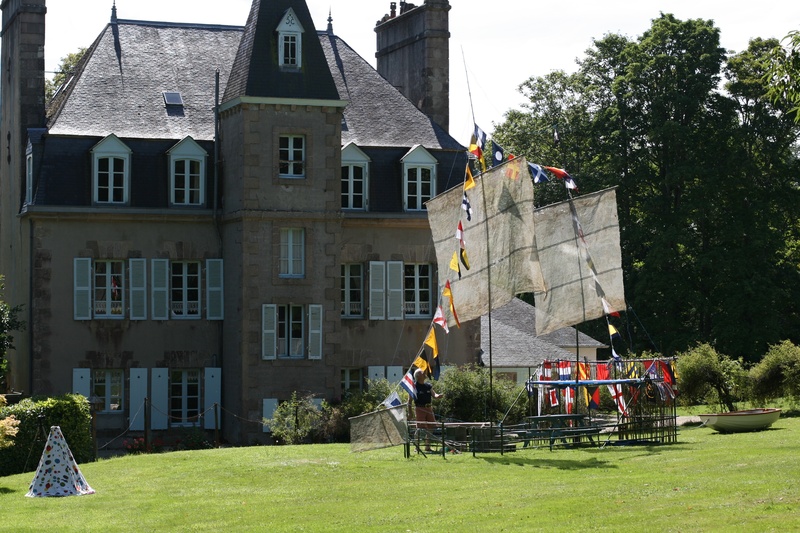 On Friday last the pirates fought their way past the Chateau du Taureau and into Coat Amour in Morlaix, mooring their ship behind the chateau. They thoroughly searched the grounds for buried treasure, using clues left by two local conspirators. 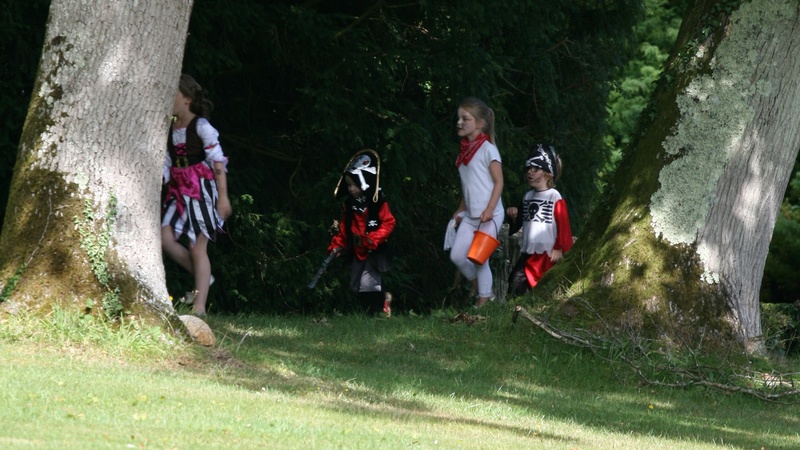 They soon found the map telling them where the treasure was buried. 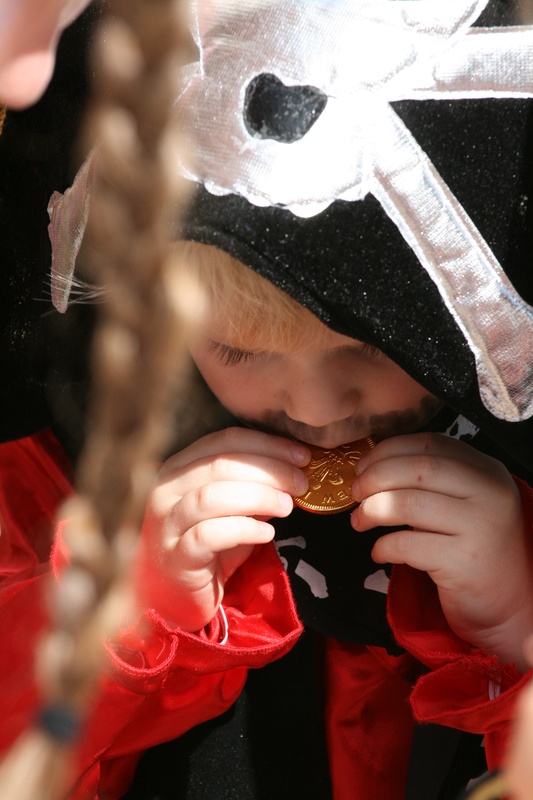 Gold pieces of eight were found in some quantities, with other trinkets and precious stones, in a brass bound treasure chest. Hmmm ~ Yep its Gold! Flushed with their success they settled down to a hearty meal on board their ship before turning in for the night! Aarrh!! 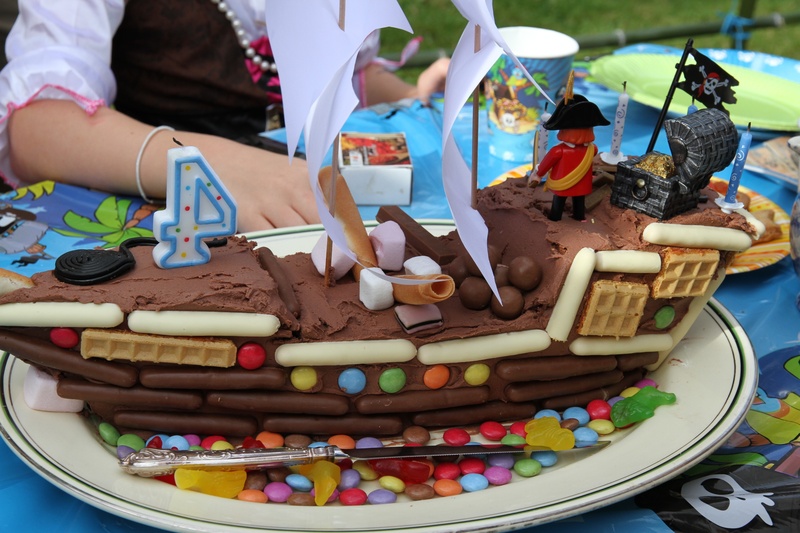 Co-incidentally the notorious pirate captain, Henry of Bristol, was celebrating his fourth birthday on the same day. 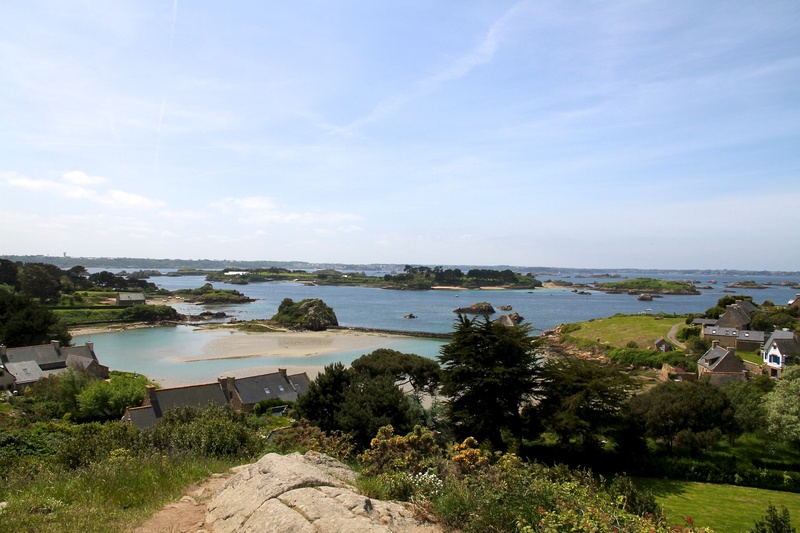 Go and visit one of the largest and most beautiful islands off the south coast of Brittany ~ Belle-Isle-en-Mer. Just before we went Jenny and I had spent a very concentrated period of time, refurbishing our larger gite, “L’Ecurie”, plus a bedroom in the manor house, and had the busiest April in our B&B ever. Basically we wanted a quiet holiday close by, to recover. We chose to go to Belle-Isle-en-Mer and to go to a hotel with a good reputation ~ La Desirade. We made some good choices! 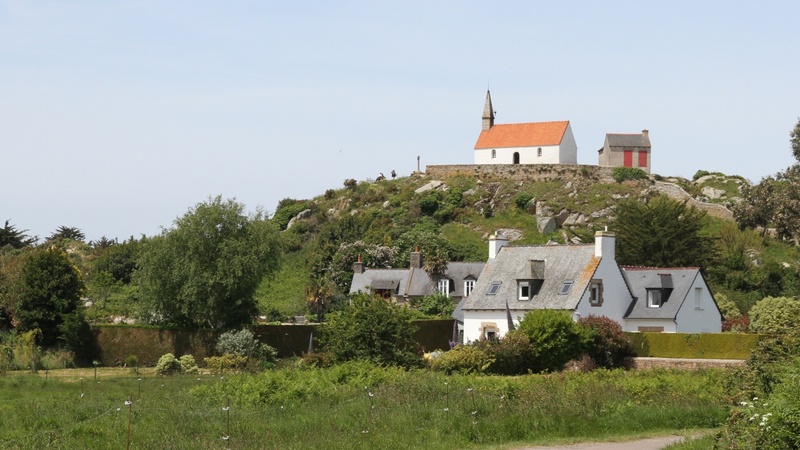 Belle-Isle-en-Mer is a charming little island, only about 20 kilometers long, not much traffic, lots of fabulous walks, deserted beautiful beaches, and with it’s own weather pattern. La Desirade was very comfortable, the staff very friendly and efficient and the breakfasts and dinners yummy! Le Palais, the main entry point to the island (and notional capital, I think) is a lovely little town dominated by the the Vauban Citadelle. This is an enormous fort, of complex design, now containing a museum and an upmarket hotel/restaurant. We spent a large proportion of the first day wandering around the battlements and the museum. 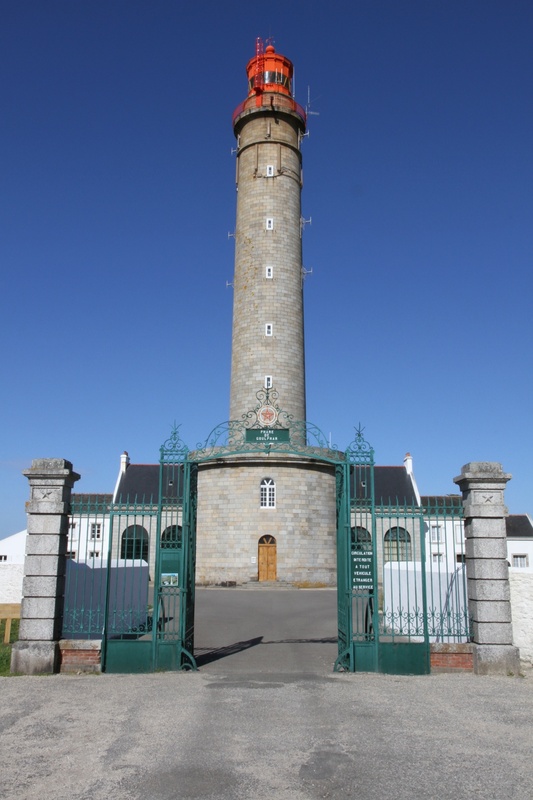 There are lots of interesting exhibits and paintings, and did you know the English once owned the island and did a swap with France for the island of Minorca! As a sailor I had always wanted to sail and moor in Ster Vraz on the west coast of Belle Isle. Needless to say I have yet to do this, but did go and see it this time and was entranced. It does not seem so small as the charts would have you believe. On the first visit the wind was blowing very strongly from the east, yet boats were coming in and out in complete calm. The coastal paths are extensive and at the weekend were very well used by walkers and mountain bikers. The beaches were deserted though and we spent most of one day on one beach and shared it with one other couple. So, in summary, go to Belle Isle, out of high season, and have a happy and wonderfully relaxing holiday. 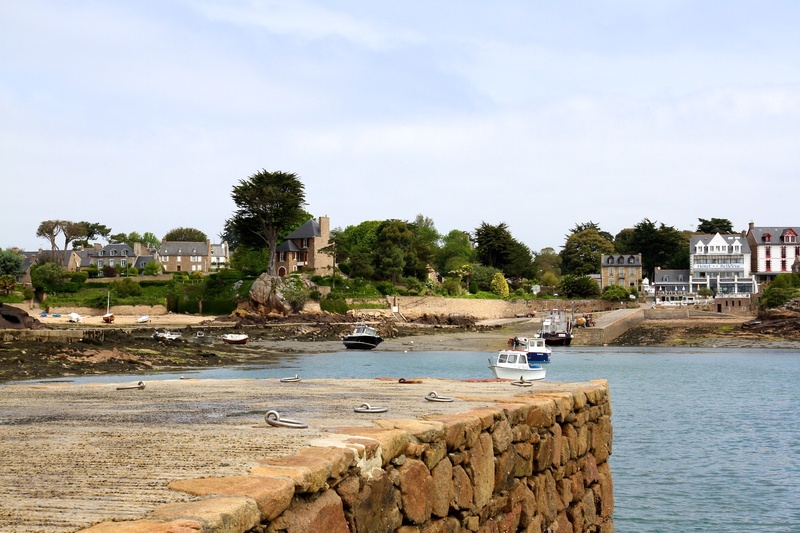 One of the most beautiful islands off the North coast of Britany is called the Isle de Brehat. 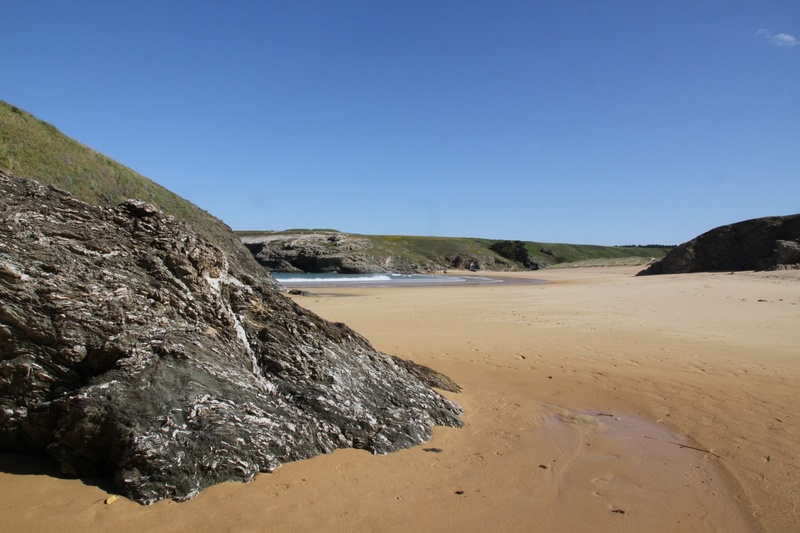 It is found on the coast of the Cotes d’Armor just north of Paimpol, and about a one hour drive from Morlaix. The approach to the departure point is well sign posted from the centre of Paimpol and the view from the top of the cliffs just before you arrive at the quay is truly fabulous, and even more amazing at low tide. The boat trip across to the island takes about ten minutes and is very pleasant. The island itself has few if any cars, it is warm, luxuriant and criss crossed by tiny sheltered lanes, that are wonderful to explore. The pink granite rocks and the pine trees, echiums and other wonderful flowers are a joy to behold. You cannot help but be taken back in time and wonder if they could tell some interesting stories. Jenny and I took our friends Chris and Diana for a quick visit to the island on the last day of May, in between guests leaving in the morning and others arriving in the early evening. The weather was very kind to us, and we were extremly lucky to arrive in time to walk onto a ferry and get to the island for about 11:30. We had to leave by 15:00, but it was enough time to walk around the main part of the island and have a picnic too. There are lots of places to hire bicycles at a reasonable prices, and I think that this will be a good idea for next time. Jenny and I can thoroughly recommend a trip to this island ~ we all had a great day out and shall return. This is a two part blog, the first part celebrates the launch of the our new web site, whilst the second part will feature the inclusion of some new super photos within the web site. I am not sure still, after seven months work, what the secrets are to creating a web-site easily. If anybody has any ideas I should love to hear from them, just for the next time around. Jenny and I wanted a refreshed, easy to use, modern, stylish replacement for our original web-site that was created for us by our friend John Worsfold about seven years ago. We have largely retained the wording from the original and indeed many of the photos. We even had a good idea of how we wanted it to look. It took us longer us much longer to achieve than expected, but in any event it is now finished and launched. I am sure that the critical and particularly the teachers amongst you, the readers of our blogs, will spot the typos and grammatical mistakes/errors. So on to some excuses. Spring has sprung, we have almost finished the complete refurbishment of our big gite L’Ecurie, with a new roof, new internal and external decorations and some little other tweaks too. We have been busy in the manor house as well with redecorating the dining room and two bedrooms plus making some changes in the garden. We have yet to take any new photographs, however, the wisteria and the azaleas around L’Ecurie are almost in full flower ~ so anytime soon! In addition we have been so busy with clients this April, and both gites are occupied so that photos have not been at the top of our agenda! 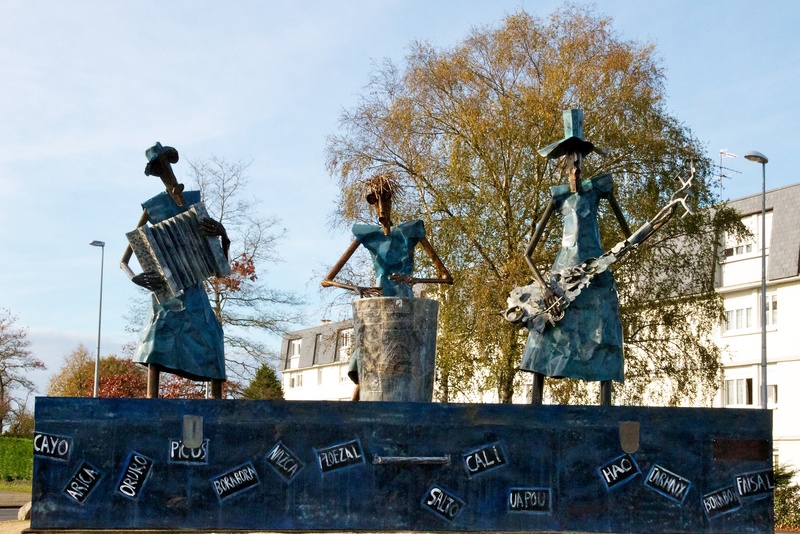 Have you ever been to the lovely central Brittany town of Carhaix Plouguer? Well you should go, as we did today to see our friends Peter and Penny Dinwiddie. Every summer there is a now famous music festival (rather like Glastonbury) and people flock from all over the world to be entertained. Hence the rather beautiful roundabout statues near to the site of the festival. 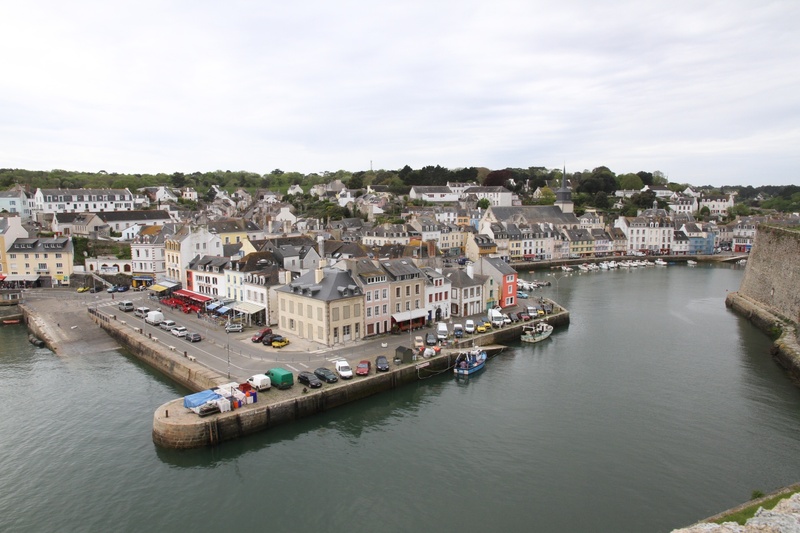 At other times of the year this is a great little town in the middle of Brittany, not too far from the charming Brest to Nantes canal and many other superb places to walk or fish. 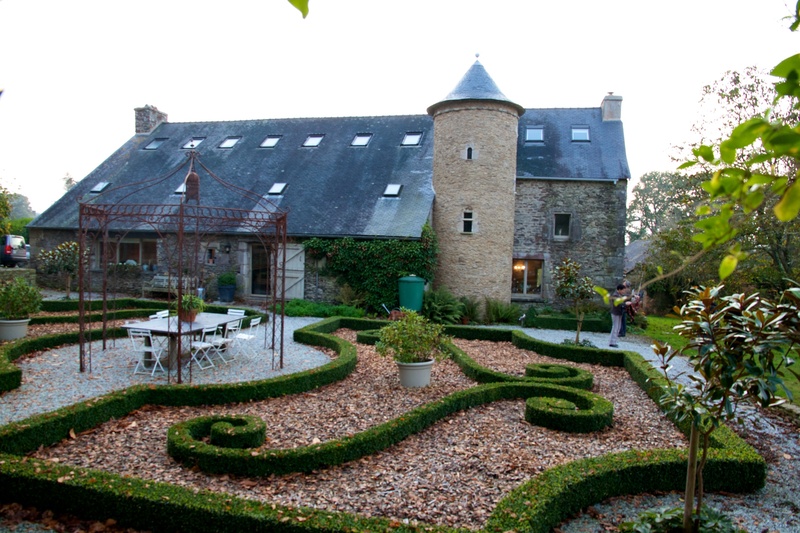 Like us Penny and Peter run a chambers d’hotes business in their old manoir house called Kerledan, on the southern extremity of Carhaix. 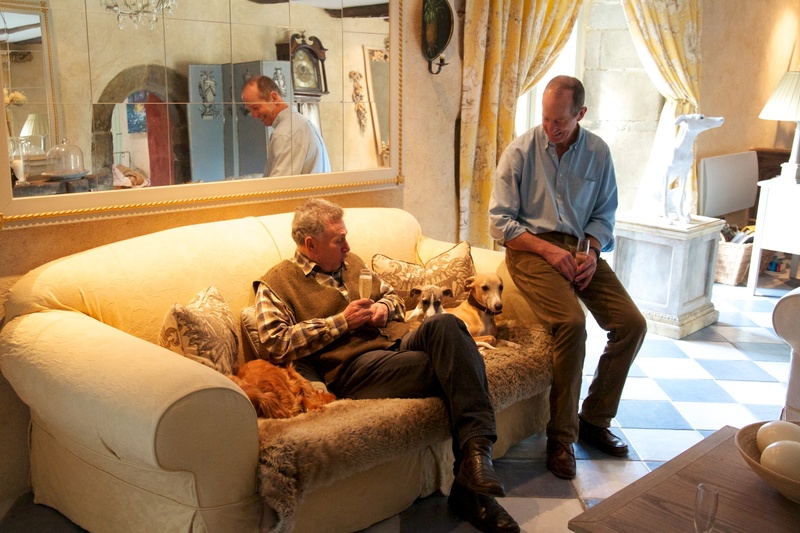 They have a number of sumptuous bedrooms and Penny’s food is to die for. It is not the place for weight watchers mind you! Thank you for lunch Penny ~ no more to eat for me today! They have recently finished the construction of a new tower with staircase to give better access to their bedrooms and their garden planting continues and many a new hedge has appeared since we were last there. You should go and stay with them. See more on their web site by clicking here. 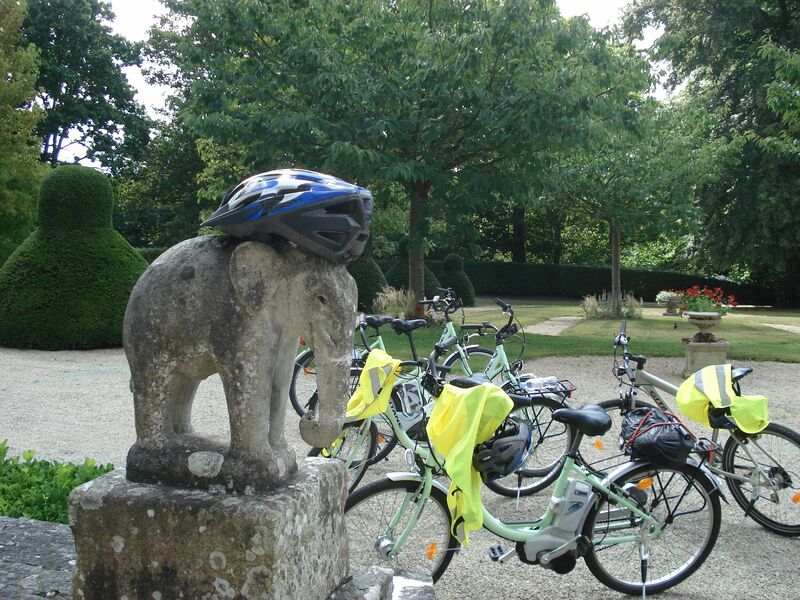 Bike hire in Morlaix / location de velo a Morlaix. Bike hire in Morliax / location de vélo a Morlaix. Quelques différents modèles sont disponibles. Vélos pour les enfants entre 6 et 12 ans. Several types of bicycle are available, including bikes for children from the age of 6 – 12 yrs. VTC – Vélo tout chemin – mixed off roader and city bike. VAE – Vélo assistance électrique. Electric bike for adults. On peut louer les remorques, porte bébé ( 9 – 20 kilos) paniers ou sacoche. Bicycles are hired with a helmet and luminous vests. Une casque et une veste lumineuse sont inclus avec la location. 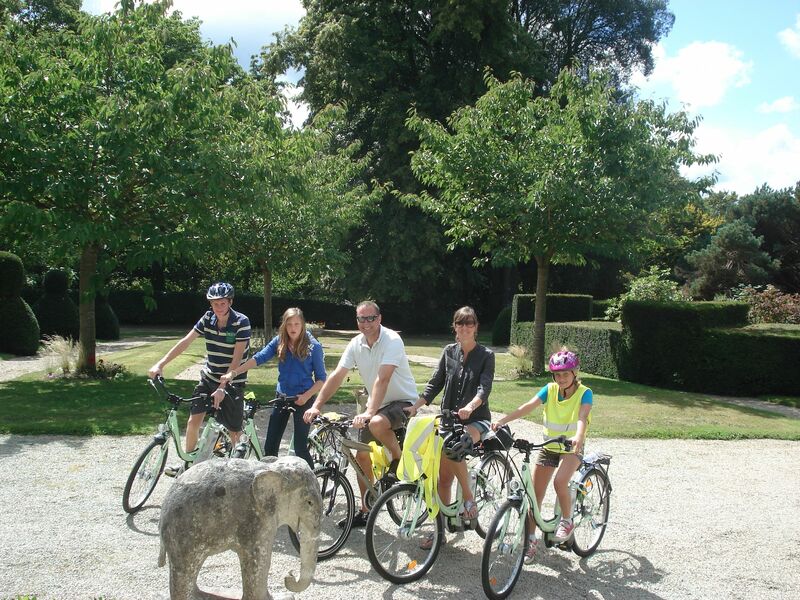 A family who stayed with us in August about to set off on an excursion! It is advisable to reserve in advance for the summer season. Vaut mieux réserver en avance pendant la saison estivale.